April showers bring May . . . super-heroes?! Our May releases are getting powered up, with a long-awaited version of Munchkin hitting store shelves. So without further ado, the secret identity of our May release is . . . This Guest Artist Edition joins the unique visual style of comic-creator Lar deSouza with Super Munchkin – a parody of capes, utility belts, day-saving, and nemeses. DeSouza's stylized comic art perfectly suits the game's pulpy sense of fun. Be a Mutant, an Exotic, a Mystic, or a Techno. Get bonuses from a Plot Device, the Telezapinator, some Heroic Angst, or the (jet-powered) Pogo Stick. The higher your Level, the more Powers you can have. Battle dastardly masterminds, devastating monsters, and invading aliens from the next dimension – from the wimpy Bucketman all the way up to the Big Ol' Planet Eater Guy himself. 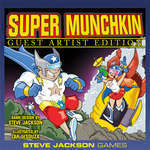 You can find Super Munchkin Guest Artist Edition at your local game store this May!